Only 64 percent of American households own their homes. That means 36 percent rent. Unfortunately, many of those renters don’t realize they are at risk for losing everything they own because they neglect to purchase renters insurance. According to Forbes Magazine, 59% of renters do not insure their belongings with a simple, inexpensive renters policy. In case of a fire, theft or other disaster, renters insurance can cover your belongings – clothes, electronics, furniture and more. Liability coverage can also protect you if someone is injured in your rental property. The National Association of Insurance Commissioners’ says the average renter pays just $184 per year for coverage between $30,000 and $50,000 with a $500 to $1,000 deductible. Depending on where you live, your cost may be a bit higher of lower. Either way, if you’re living on a budget, that’s only about $15 per month. It’s a small price to pay to protect your possessions. Talk to your insurance agent and estimate the cost of your belongings to determine the appropriate coverage. After you arrange your coverage, further protect yourself by doing your best to record everything you own, in case you need to make a claim. Keep your receipts and store them away from your apartment if possible. Take a video of your possessions and update it every year. Then, if you need to make a claim, you have all the information you need to get a fair payment to cover your loss. 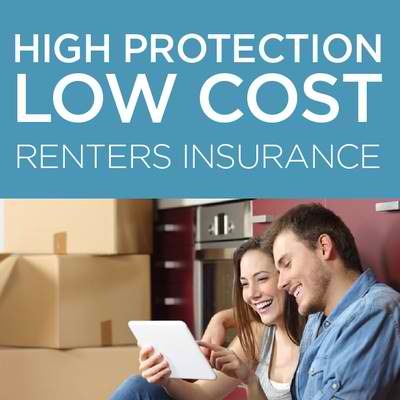 Protect yourself and talk to an agent about renters insurance today.